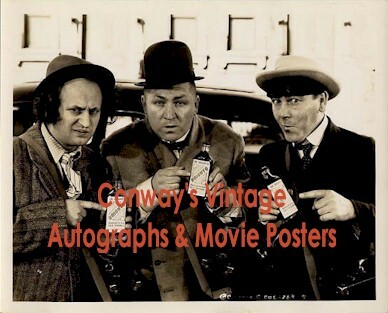 Authentic Three Stooges autographs are extremely rare, particularly with a Curly signature. Shemp is also quite rare as both he and Curly unfortunately lived relatively short lives. You will see many Three Stooges autographs online such as Ebay, but the chances of these being authentic are EXTREMELY LOW. It is estimated as high as 90% of Ebay autographs are fake. We are not an anonymous Ebay seller. We have been collecting, buying and selling rare vintage autographs memorabilia for over 20 years and most importantly we GUARANTEE our Autographs to be AUTHENTIC FOR LIFE. We have a full time online store and are always here to answer your questions and ensure you are as excited about owning such Rare Treasures like these as we are. 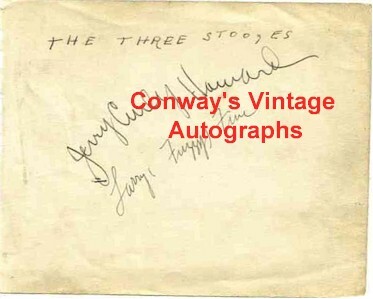 Jerry "Curly" Howard/Larry Fine - "Three Stooges"
VERY VERY RARE Three Stooges autographs. What makes this so extremely rare is how Curly signed with his full real name!, "Jerry Curly Howard", Larry signs "Larry Fuzzy Fine". Scarcely ever seen in the marketplace. Autograph dealers and auctions would sell a piece like this for well over $2000. A high end dealer like Frazer's or History Direct most likely $3000-5000. The original recipient has written in print "THE THREE STOOGES" on the top of album page. The first AUTHENTIC "Jerry Howard" we have seen in many years! We also will include a copy of the original photo of Curly and Larry from around 1930. We own the original. Life Time COA and letter of Provenance of how it was acquired from a collector who collected autographs in the 1940's. 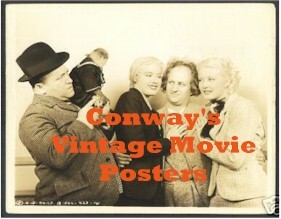 Shemp Howard - "Three Stooges"
Shemp Howard - Vintage Original Authentic inscribed Autographs. Vintage fountain pen signature and inscription, “To ‘Joey’ Good luck, The 3 Stooges, Shemp,” on an off-white 6 x 3.5 lined sheet. In fine condition, with a touch of light toning. R&R COA. Guaranteed authentic for life! This is an opportunity to get a peak inside of the heads of three of the funniest men in comedy history! The dealer I acquired these from explains below and in a detailed letter how he obtained these several years ago. 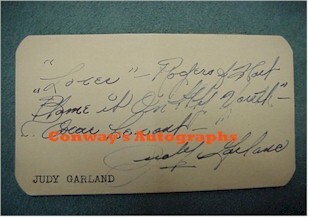 The autographs were purchased from the widow of an old time big band leader in the 30's/40's . They have been in my possession for many years. He would ask that any celebrity that came to hear his band, sign a card with the name of their favorite song and he would dedicate the tune to them when the band played it! The cards measure 2 1/4" x 4 1/4" and the signatures are in ink pen. There is a slight crease in all of the cards. The names were also typed in the lower left corners. 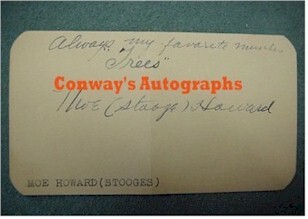 The first card reads, "Always my favorite number, "Trees", Moe (Stooge) Howard". 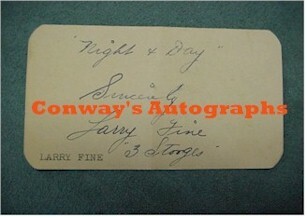 The second card reads, "Night & Day, Sincerely, Larry Fine, 3 Stooges". And the last card reads, "Always my favorite, "Dark Eyes" (Don't laugh) Curly Howard 3 Stooges". There were a few other cards in this collection including Judy Garland, pictured here. Although she is not available, I wanted to include an image of it to give additional examples of the stature of this fine, authentic collection. If you are a Stooge fan, I don't have to tell you the rarity of these "FULL" signatures, particularly with "Curly". Never before have I seen such inscriptions that provide a personal side of these three comedy legends. In 25 years of collecting autographs I have never seen a more incredible set of Three Stooges signatures then this!